Shane DiGiovanna remembers the first speech he ever gave. He was talking into a microphone to a group of people that were jumping into Southport Harbor on New Year’s Day. They were jumping into Long Island Sound in the winter to raise money and awareness for a rare, horrible life- threatening skin condition called epidermolysis bullosa. He was all bundled up to ward off the cold and he had on a Batman belt. Shane was 9 years old and he had EB. His first attempt at public speaking was an unqualified success. The adults all listened attentively to, and were inspired by, the Mill Hill student. He explained that the jumpers would have a few seconds of pain, but those with EB endure a lifetime of pain. The adults and a few brave teens promptly jumped into the freezing water. Money was raised and attention was paid by media outlets to this little-known disease. Over the years, Shane slowly realized that he could make a difference, maybe not with his body, but perhaps with his voice. Eventually Shane’s family moved back to Cincinnati to be near the Children’s Hospital there. That hospital had established a special division dedicated to the research and treatment of EB. Shane did that for a few years, then others began to ask him to speak. When they opened a wing of the Children’s Hospital dedicated to Neil Armstrong, Shane gave a talk sandwiched between two NASA astronauts — Shane more than held his own. He also did a Tedx Talk. Now, Shane, a sophomore at Rice University in Houston, has become a sought-after professional motivational speaker. He was featured in television commercials run by the Hospital that ran during Cincinnati Reds games. Shane quickly became a celebrity among local baseball fans. He is often recognized when home in Cincinnati. But Shane wasn’t always a talker. He was born deaf and had to have cochlear implants to hear and to help him find his speaking voice. Since he learned to talk, he hasn’t stopped expressing himself and thanking his fast-growing network of fans and followers who help support his cause—to raise awareness of and help fund research to lead to a cure for EB one day. He has spoken at both Fortune 500 companies and educational institutions. Not surprisingly, Shane’s speech themes are often about “turning adversity into opportunity.” He touches on some of the struggles he has faced with his debilitating condition and how it has shaped him into someone who sees — and seizes — opportunities. For example, Shane is part of a group at Rice University to help make the campus more accessible to students with physical disabilities, and he has also worked on a prosthetic that allows people without fingers to write with a pencil or pen. It has not been easy for Shane. 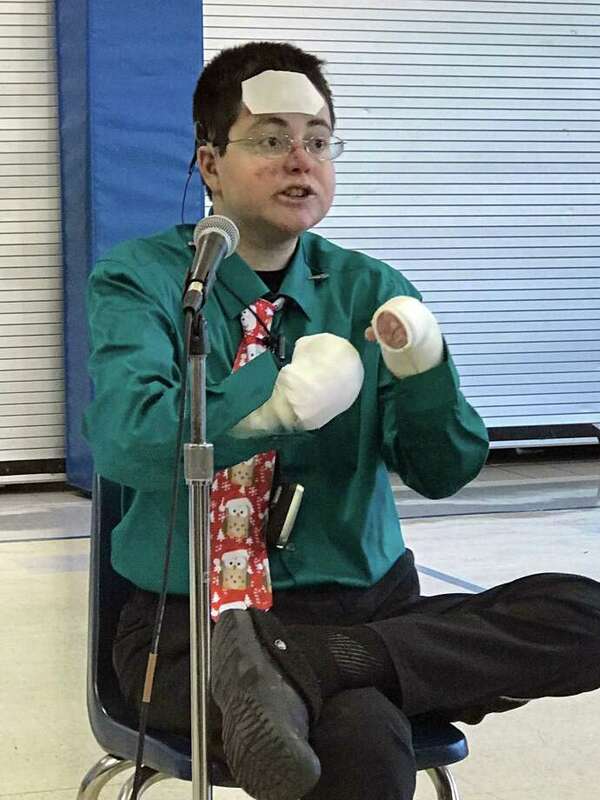 He has endured dozens of surgeries, hours of daily bandages, and daily pain, but he still manages to remain upbeat and to share an inspiring, positive message. He wants to share with audiences some of the spirit and passion that has pushed him to make a difference and that’s why he started his professional motivational speaking business, Shane Talks. https://shanetalks.com/ is Shane’s platform to share his voice with the world. Thomas Lawlor lives in Southport with his wife and two daughters. His column appears every other Friday. He can be reached by email at Tlawlor@mcommunications.com.